Can you guess all four drawings? Ringo star, Simpsons,road and albert Einstein? Nicely done! Actually, the first one is my attempt at drawing Ozzy. Well done! We should set up a game if you're patient enough. I often take WAY too long to finish my drawings! Good guesses! I drew Ozzy and a road/highway, I can't recall which. No, you are just incredibly talented my friend! Always amazed by your creativity! I agree with Soozle's answers! Very cool! I got your likenesses. It looks fun! Maybe W will help to make you busy, lol. Happy Day! Enjoy the rest of the week, Karren! I just wish I had more time as I never seem to have enough. Have a great day. Thanks for the linky. Hope you will visit me soon. Yay! Happy WW to you, too, Dominique! Just don't become one of those helicopter moms with too much time on her hands. I'll have to say: no clue, the simpsons, road trip, and Einstein! Diana, you are so talented :) You always impress me with your creativity! You never know where this will lead!! Great drawings. your pics are amazing!!! mine are all stick figures and no detail! 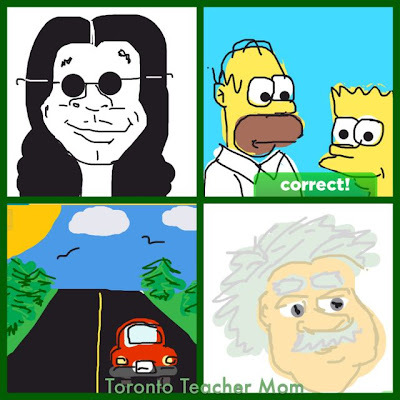 Ozzy Osborne, The Simpsons, The open road and Einstein? Ozzy Osborne, The Simpsons, ??? and Einstein. Clearly you have yet another undiscovered talent! Love it! Thanks for hosting the linky. I love it, lol, great job!! !